Troy and McLouth will hook up in what appears on paper to be a fairly even first-round game. McLouth is back in the playoffs after a 9-2 season a year ago where the Bulldogs reached the 2-1A quarterfinals. Back from that team is Nic McAferty, a Kpreps All-State selection at wide receiver a year ago. This season, McAferty has nearly 600 receiving yards and six touchdowns, but has also rushed for more than 500 yards and eight scores. Drew Cerny leads McLouth with more than 1,100 rushing yards and 16 scores. McLouth’s two losses this season have come to playoff qualifiers Nemaha Valley (8-1) and Olpe (6-3). Troy is back in the playoffs for the first time since 2009. Prior to that three-year drought, the Trojans were a consistent playoff qualifier having reached the postseason eight straight times from 2002 to 2009. After a 2-2 start to the season, the Trojans have won four of their last five games with the lone loss coming to top-ranked Centralia. During that time, Tristan Speer stepped in at quarterback after transferring from Doniphan West where he led the Mustangs to a 9-2 mark and a quarterfinal appearance as a freshman. Speer has played the past four games for Troy and has passed for 436 yards and six touchdowns, while rushing for 200 more yards and four scores. Collin Jasper has moved to receiver after playing quarterback early in the season. Jake Ross leads the Trojan wideouts with 300 yards and two scores, but 11 different players have receptions. Colton Masters (300 yards) and Derek Franken (360 yards) lead the Trojan in the backfield. The Bulldogs and Trojans have one common opponent; Speer’s former school Doniphan West. McLouth beat the Mustangs 28-6 in Week 2, while Troy defeated Doniphan West 34-15 last week. It’s safe to say that Northern Heights and Lyndon are familiar with each other. The Tigers finished the regular season by beating Northern Heights 36-0 last week. Now, the Wildcats travel to face Lyndon for the second consecutive week. Lyndon cruised through the regular season, scoring the second most points in Class 2-1A with 463 while allowing only 120. The Flint Hills League champions are led by senior quarterback Joe Walsh, who has passed for 1,293 yards with 15 touchdowns and only two interceptions. However, Walsh missed Thursday’s victory over the Wildcats with an injury. Gage Brecheisen stepped in and passed for 74 yards and a touchdown and added 90 yards rushing and two scores. Senior Josh Owens has rushed for 1,499 yards and 21 touchdowns on 124 carries. Donovan Reed led Northern Heights with 107 yards rushing during last week’s loss to Lyndon. Plainsmen coach Randall Rath, in his 24th year with Oakley and 16th as head coach, has announced his resignation, effective end of the year. Oakley has Kansas’ No. 1 scoring defense with just 20 points allowed. Junior nose guard Ryan Kuhn is already one of Kansas’ top linemen and had 3.5 tackles for loss in a Week 9 shutout win at Ellis. Elkhart, in his first playoff appearance under fourth-year coach Khris Buckner, has already matched its win total from the last two years combined. 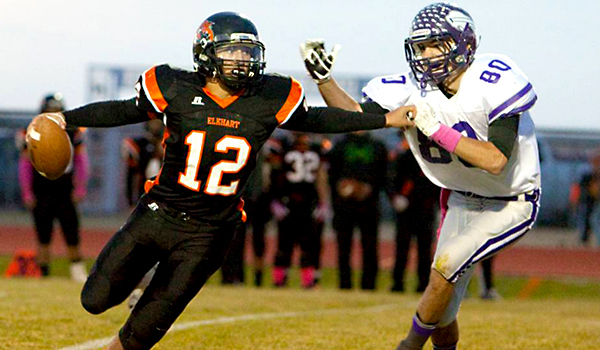 The Wildcats run the blur offense behind senior quarterback Alex Gomez, a four-year starter. Elkhart averages 63 snaps per contest, second-best of Kansas’ top-25 offenses. However, Elkhart fell 28-6 to Meade’s power rushing attack in Week 8 because it couldn’t get the Buffs off the field. Meade had 74 plays (67 rushes) and Elkhart had just 39 snaps. Gomez, who has thrown for 6,340 yards and 73 scores in his career, completed 5 of 15 passes for 61 yards. Oakley will play a similar style; Rath wants to have 60 offensive snaps Friday to keep Elkhart’s offense off the field. Sterling and Smith Center will square off in a rematch from the first round last season. Sterling, behind then-standout quarterback and Shrine Bowler Riley Galyon, defeated Smith Center 26-16 in the final game of legendary coach Roger Barta’s career. Longtime junior high coach Darren Sasse took over and led the Redmen to a district title and five straight victories to close the regular season. Senior Clint Rogers has enjoyed a strong year with 96 carries for 763 yards and 10 TDs, and has 12 catches for 220 yards and four scores. Senior quarterback Kody Molzahn is 31 of 68 for 548 yards with nine TDs. Smith Center has averaged 279 rushing yards per contest, passed for 69 yards per game and allowed just 184 yards per contest (144 rushing). Sterling again started slowly with four straight losses to open the season, but rebounded to go 4-1 in district play, including a 26-20 overtime win in Week 8 against Inman that effectively clinched a playoff berth. Sterling has qualified for the playoffs every year since 2004, but last season was the only victory in the span. Smith Center is very deep and experienced and earns the victory.